debating on whether to attempt going into work today. We have had freezing rain and snow that began sometime in the middle of the night and it is still dark out and I am suppose to be at work within the next five minutes. It is a 1/2 hour drive and I definitely know if I am going I will be late. I work in the Trauma Department and really do not want to be a patient, so I decided that I will wait until it is at least light out before I decide. Another reason not go in is that my husband and I are leaving for Cabo San Lucas on Sunday and we have had this trip planned for almost a year and I would really hate not to be able to go. Wouldn't it be a great day to just scrap? Ohhh that little voice inside my head may be getting my self in trouble! So.......do you think I have talked myself out of going yet, why didn't I bring my laptop home with me yesterday so I could just work from home, silly me!!! Stay safe! UPDATE...Didn't take me long to decide to stay home after my husband left for work, he said it was like driving on a sheet of ice and that there were many, many vehicles in the ditches! Im sitting here thinking the same thing!!! It is pure ice out there - Ill probably stay home and wrap gifts!!! Yes, I did see that I won on Mays blog - thanks!! I hope you so whatever will keep you safe!!!!! Stay home. 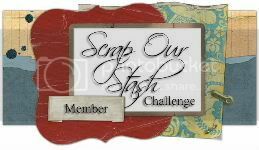 Listen to your favorite music and scrapbooking would not be a bad idea. Hope you have a great trip. Getting out of the cold on vacation would be great!!! !